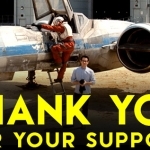 Last May, the contest was launched as part of the Star Wars: Force For Change initiative, and over $5 million has seen been raised for the charity through this contest. To enter, contestants had to give a minimum donation of $10, with those who gave more getting more entries into the contest. 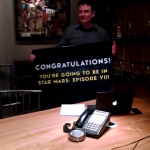 August 11, 2014 was the date scheduled for the grand-prize winner to be announced. 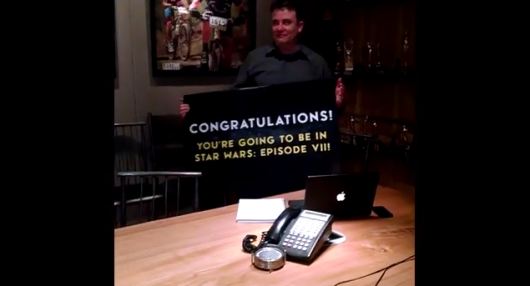 Abrams took to Twitter this morning to post a photo of a note of thanks and a welcome to Barns, with the note being held by a robot/droid hand. Congratulations to D.C. Barns, we hope it’s everything you’ve ever dreamed of and more – we’ll be living vicariously through you! The Force For Change program raised $4.26 million for UNICEF Innovation Labs and Programs, with Disney committing to donation another $1 million, according to the press release sent out this afternoon by Walt Disney Studios, which stated that the money will support the equivalent of 7-8 new Innovation Labs to aid children and families. 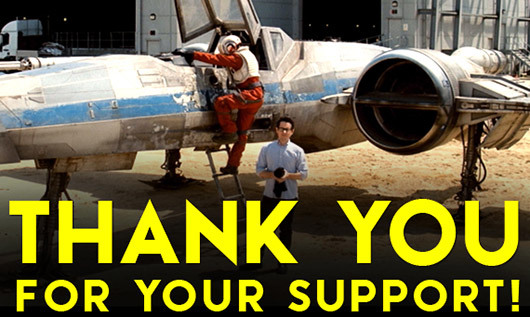 Visit StarWars.com/ForceForChange for more details about this charity.